The Russian firearms leader, the Kalashnikov Concern, has unveiled a prototype pistol which they hope will be adopted by the Russian military. Part of the Rostec State Corporation, Kalashnikov Concern unveiled the new Lebedev Pistol, a 9x19mm calibre pistol PL-14 at the recent International Military Technical Forum Army 2015. “The universality of the pistol means it can be used not only as a combat weapon for the army and police but also as a sports pistol for various class competitions,” said Aleksey Krivoruchko, CEO of the Kalashnikov Concern. “For the pistol’s different uses with aiming elements, we intend to produce variants with altered firing-mechanism characteristics and to make modifications that will allow it to be used in sports competitions." The pistol is uniquely less thick than its counterparts in the same class; 28 mm around the handle and 21 mm at the front nozzle. The polymer-framed double-stack PL-14 pistol and its configuration makes it possible to use the pistol with either the right or left hand, and makes it easy to wear, draw, and use. A Picatinny rail has been integrated into the pistol’s design. Using automatic calculation methods in the creation of the pistol provides it with great inbuilt mechanisms which make it comfortable for the shooter to discharge, with minimal kickback after firing, and rapid return to the line of sight. These factors allow for a rapid second shot so that fire can quickly be repositioned onto other targets. Special attention was paid to the security of the weapon. 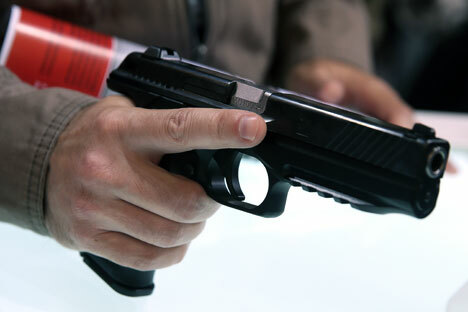 The applied trigger mechanism solution ensures that the loaded pistol cannot fire spontaneously, even after falling from great height onto a hard surface. Additionally, increased gun-handling safety provides for a high efficiency indicator of whether there is a cartridge in the chamber. This makes it possible to quickly determine if the gun is loaded or not “by the touch,” and without error.